The Pixie Bob cat is a wild-looking, short tailed cat. We explore the truth behind the origin of this domestic cat breed. In 1985, Carol Anne Brewer, a cat breeder from Washington State acquired a male, spotted, short-tailed, polydactyl* cat from a family living in Washington State. In 1986, Brewer rescued another classic patterned, short-tailed cat. She named this tom, Keba. Keba and a neighboring domestic cat, named Maggie later mated producing a litter of kittens. A kitten in the litter resembled her father - having muted spotting on a reddish-fawn coat. This wild-looking, polydactyl cat was named Pixie. Pixie became the founding mother of the breed and inspired the name for the cat breed. 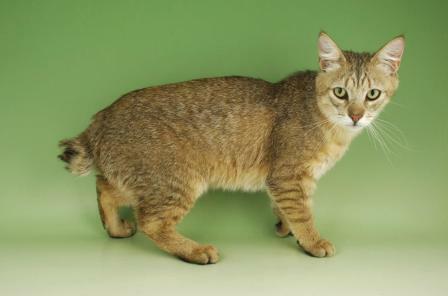 Over the course of some years Ms Brewer found 20 more cats with tabby marking and short tails. She named them 'Legend Cats' - a name which is trademark protected. She firmly believed that the Pixie Bob originated from a natural mating involving domestic barn cats and small, wild Bobcats. Matings between wild and domestic cats generally does not occur. Some believe it is possible if wild cats are scarce or under threat of survival. Experts who have conducted DNA testing have apparently failed to discover any Bobcat marker-genes in the Pixie Bob. It would therefore appear that whilst this cat has distinctive and unique features that resemble the wild American Bobcat, it is purely a co-incidence! *Polydactyl - a cat born with additional toes on one or more of its paws. This congenital anomaly is also called hyperdactyl and is as a result of a genetic mutation. The International Cat Association (TICA) classifies the cat as a domestic cat that has the visual similarity of the wild Bobcat. In the late 90's this new cat breed was granted Championship status with TICA. This short-tailed cat is not recognized by CFA (Cat Fanciers' Association) and GCCF (Governing Council of the Cat Fancy) and is fairly rare outside of America. Breeding pairs were imported into France in 2001 and into the UK in 2004. This is a large and strong cat with a medium sized, muscular and heavily-boned body. It has prominent shoulders and hips and a broad chest and the back slopes upwards from the shoulders to the hips resulting in the back not been 'level'. The legs compliment the torso and are long, muscular, strong and heavy boned and the back legs are slightly longer than the front legs. Their paws are large with polydactylism accepted - i.e. 5 - 6 toes on the back feet and 6 -7 toes on the front feet. They walk with a rolling gait. The Pixie Bob cat's tail is described as thick and short and the bone in the tail should be at least 2 inches (5.0 cm) long. The tail is sometimes knotted or kinked, but it must move naturally and always be flexible. This cat has a broad, medium to large head, prominent forehead and the shape is described as an 'inverted pear'. Its muzzle should be broad and full, the nose slightly convex and wide and the chin strong and well developed. The eyes are slightly oval in shape, medium sized and deep set. Its eyes are described as being heavily hooded, with bushy brows. Eye color ranges from gold to brown or even gooseberry green. Ears should be well spaced, broad at the base and have rounded tips and preferably have lynx tips. Generally, their double coats should be wooly, soft, silky and waterproof and when touched, it should feel as though the body is well padded with fur. It has become standard to keep cats indoors as a safety precaution. Cats that are allowed to free-roam are at risk of been injured by motor vehicles, dogs and other cats. There is also an increased risk of contracting infectious feline diseases. The Pixie Bob cat can adapt to indoor living provided that it has sufficient space to explore. Also provide your cat with an environment filled with toys, cat gyms, cat scratchers and possible even an indoor garden. This cat would be happiest in a safe and enclosed garden which is escape-proof. These cats have the character and personality of domestic cats, but the poise and physique of a Bobcat. 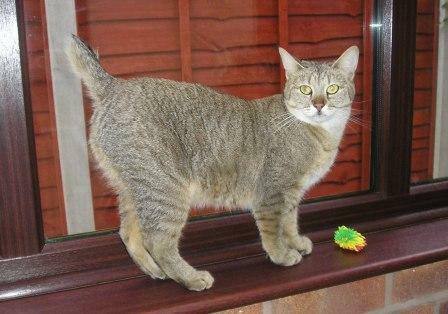 They are described as social, active and relaxed cats. Whilst they are calm and docile, this should not be interpreted as lazy. They are in fact very playful and active and love to participate in games. Owners of the Pixie Bob describe them as inquisitive cats that love to get involved in activities. They enjoy the company of children and other animals in the household. Pixiebobs are intelligent and are often described as dog-like - they can be easily leash-trained for walks and they enjoy a ride in a car. Devoted and loyal pets, they love to communicate in Pixie Bob language which includes, quiet chirps and even the occasional growl (they do not meow). These cats do not tolerate solitude and it is therefore preferable that you consider getting two cats. Bi-weekly grooming is recommended to keep the coat in tip-top condition. Visit the chapter on cat hair care for great tips and advice for grooming short and longhaired cats. 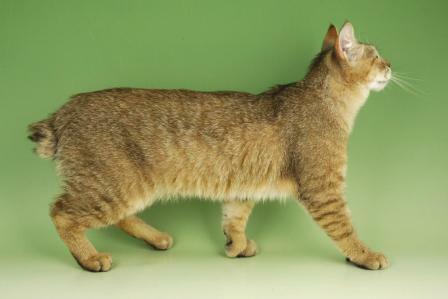 This is a healthy, hardy cat breed and genetic disorders are rare. Dystocia (difficult birth delivery and labor due to is abnormal fetal size or positioning of the fetus). Like all cats they are susceptible to common infectious feline diseases so please do vaccinate your cat. To keep your cat in good condition and healthy, you should feed it the best cat food possible. The chapter on cat food provides excellent information on the different types of foods and nutrition. Water and not milk is also an essential part of the diet. The average life span is 12 years, which is a medium-to-long life expectancy. Life expectancy is dependent on numerous factors which are explained in detail in the chapter on how long do cats live.